Chris Huston runs HeismanPundit.com and writes for CBSSports.com. His weekly Heisman Straw Poll shows Kansas State’s QB Collin Klein holding a rather commanding lead in the Heisman voting. While a lot can still happen between now and December, the chances of Kansas State bringing home a Heisman Trophy is looking more and more like a real possibility. 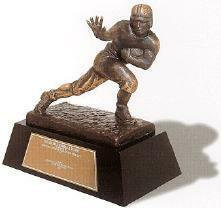 This entry was posted in 2012, Awards, Heisman, Kansas State by Travis Normand. Bookmark the permalink.